If Rivers Cuomo sounds conflicted on Weezer's new album Everything Will Be Alright in the End, it shouldn't be that surprising, given that he's had to live with people criticizing the majority of the band's output since the mid '90s. If Rivers Cuomo sounds conflicted on Weezer's new album Everything Will Be Alright in the End, it shouldn't be that surprising, given that he's had to live with people criticizing the majority of the band's output since the mid '90s. And conflicted he is, torn between trying to recreate the "good ol' days" according to Blue Album and Pinkerton fans and doing what he wants to do as a man at a different point in his life. While Cuomo openly apologizes to fans for the band's output over the past decade on lead single "Back to the Shack," the bespectacled frontman also fights back on "I've Had It Up to Here." 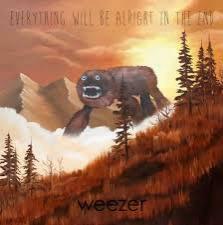 Ultimately, Everything Will Be Alright in the End lands somewhere in the middle, a fairly solid album with some choice cuts ("Cleopatra" and "Foolish Father") that surpasses the expectations of Weezer doubters, but can't quite stand up to the band's mid '90s glory.